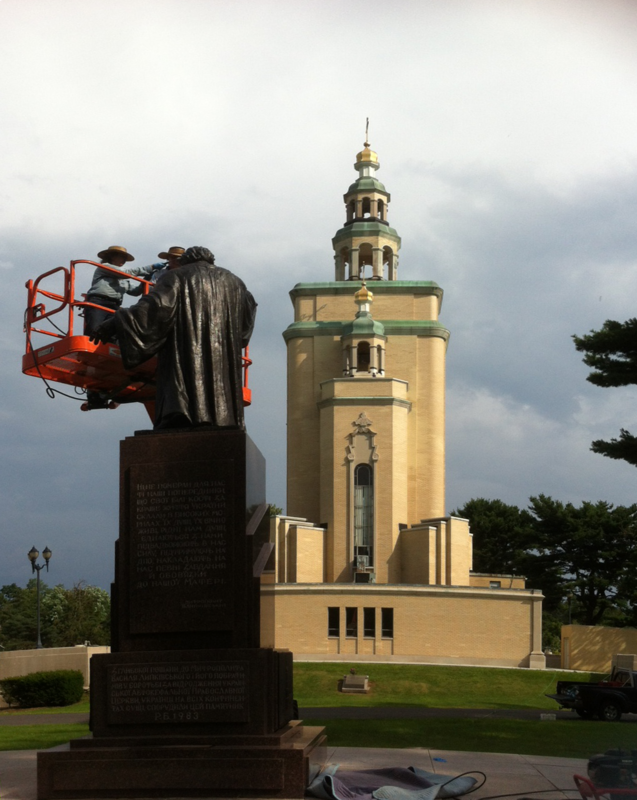 On July 7th, 2015, professionals with a local company that specializes in erecting and maintaining outdoor sculptures and monuments came by to clean and do minor maintenance on the two large sculptures by Petro Kapschutschenko that stand near St. Andrew Memorial Church in South Bound Brook on the Metropolia Center campus (where the Center also has its home). The monuments to Metropolitan Vasyl' Lypkivsky and St. Ol'ha date from the 1980s and are still in very good shape. Petro Kapschutschenko was a prolific artist who not only designed large-scale works, but also many small sculptures in media as varied as terra cotta, bronze, and porcelain. He was born in 1915 in the old Cossack village of Sukhachivtsi in south-central Ukraine (now a suburb of the city of Dnipropetrovsk). After the Nazi invasion of Ukraine, he and his wife were taken to Germany as agricultural forced laborers, and then joined the ranks of the many Displaced Persons in western Germany. In 1949, he and his family were able to resettle in Argentina. Living in Buenos Aires, he made small sculptures in ceramic and terra cotta under the pseudonym “Pedro Enko”. His reputation in the Argentine art world grew, and he was elected to the Free University of the Humanities in 1961. In 1963 he and his family moved to the United States at the invitation of Petro Mehyka, the director of the Ukrainian Art Studio in Philadelphia. He participated in numerous exhibitions in galleries throughout the US. After Ukrainian Independence in 1991, he made a return to his native land with three major solo shows of his sculptures in Kyiv. He died in 2006 and is buried at St. Andrew Cemetery. In addition to the two monumental sculptures at the Metropolia Center, Kapschutschenko created more than 7,000 miniatures in a variety of media. Although many of these works now reside in museums in Ukraine, quite a few remain in institutional and private collections in the United States. In particular, a number his sculptures are in the personal collection of his son-in-law John Bruce Schmitt. Mr. Schmitt has already donated a number of bronze and terra cotta sculptures from his collection to the Center's museum collection, and has funded a gallery in the new Patriarch Mstyslav Museum building that will be dedicated to Kapschutschenko's life and work.